I had always been curious about DuckDuckGo and played around with it a few times in the past, but in May of this year DuckDuckGo released a new interface and a ton of new features. 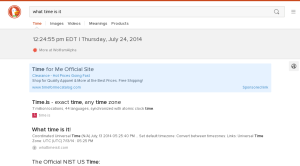 On July 9th I decided to give it a try and use DuckDuckGo as my primary search engine. Here are my thoughts after using DuckDuckGo as my primary search engine for a month, both good and bad. In writing this I used “electric cars” as my search term. I had no reason for picking this other than it’s a subject that interests me. I had no idea what either Google or DuckDuckGo would show. DuckDuckGo is great for general searches, possibly better than Google. By a general search I mean one where you’re not looking for a specific answer, but more looking for information on a subject. I think this is because of what DuckDuckGo calls the “Filter Bubble”. What is a the “Filter Bubble”? Google records past queries submitted by users to create a general understanding of that user’s likes and dislikes. The more you use it the more it knows about you. It will then use this understanding of you to present site you will like. For example, I really want a Tesla Model S. I’m always searching for news about Tesla Motors and from the context of my searches I clearly love the company. Google has recorded all these searches, and now knows that I like Tesla Motors. So now if I search for “electric cars” I’m more likely to get articles about Tesla Motors than about electric cars in general. However, the amount of Tesla Motors related results depends on new news about Tesla Motors. 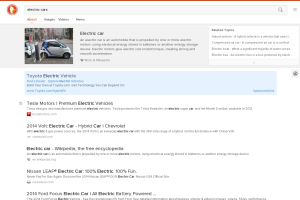 In contrast to that DuckDuckGo doesn’t record my search history, so a general search about electric cars is more likely to bring me a larger variety of results, some articles discussing new innovations, some discussing the engineering and technology behind the cars, and of course because Tesla Motors is hugely popular, some discussing Tesla Motors. If I’m looking for an answer to a specific question DuckDuckGo is not as good as Google. This is again because of the “Filter Bubble”. Again, because Google knows what I like and dislike it knows how to look for stuff I want. When I searched on DuckDuckGo for this technology it showed as the fifth result, whereas Google showed it as the first results. I then used the browser of another computer with no ties to me and searched again on Google. This time Google ranked the technology at the same level as DuckDuckGo, because Google didn’t know that computer’s preference. Most times functionality of a technology matters more than the look, but layout and organization do matter a lot more than we developers think. While Google is organized I’ve come to think that DuckDuckGo is organized better. 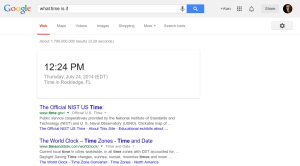 It has less clutter and search results are much easier to see. I like the hierarchy of the information. 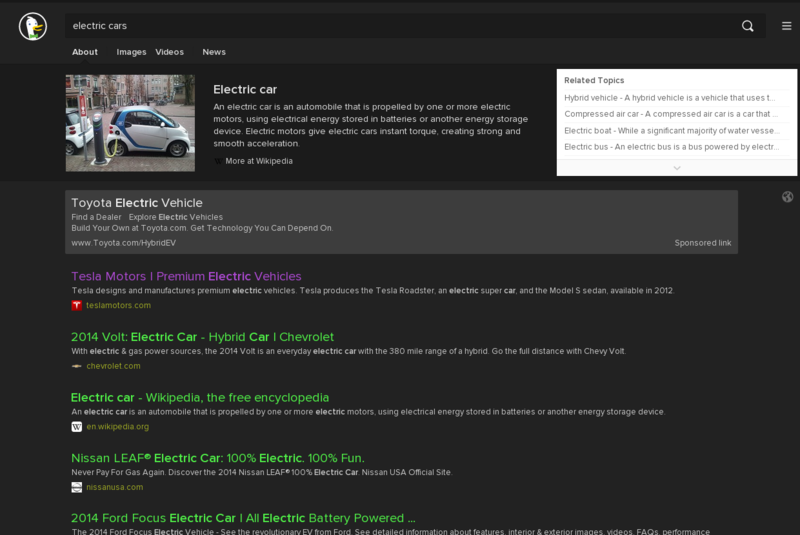 A general overview of “electric cars” is at the top of the results, pulled from Wikipedia. The search results then follow this. I like that if I search for a new subject, get a quick primer on the subject, then start diving into the search results. 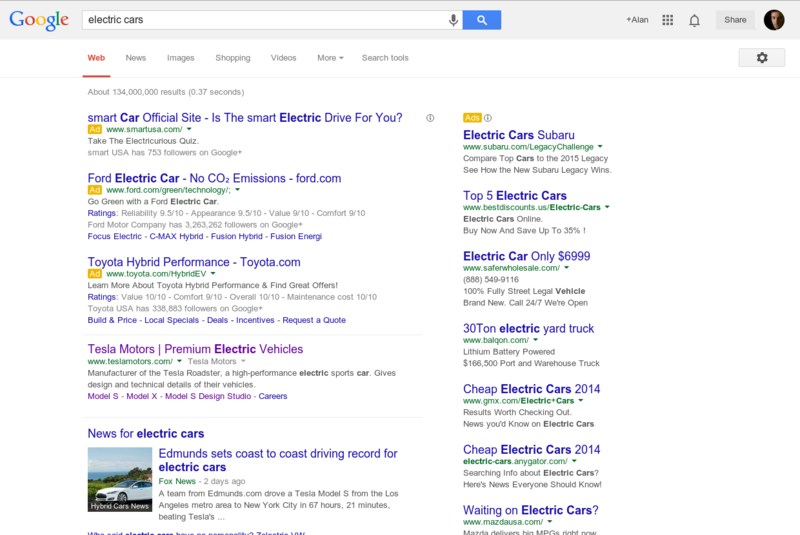 In contrast Google’s highest level of information are ads, then more ads. After that the results are pretty comparable. DuckDuckGo is also themeable. You can choose from light or dark themes, or even create your own theme. I usually use a dark theme because I work at night and it’s easier on my eyes. Both Google and DuckDuckGo have instant answers, but I’ve found that DuckDuckGo’s instant answers are often more reliable. This is because most of DuckDuckGo’s instant answers are pulled from WolframAlpha, a great computational knowledge engine. It was the primary source Siri went to as well to get data. Google on the other hand uses it’s own knowledge engine called Knowledge Graph which is primarily powered by Freebase a knowledge base acquired by Google in 2010. Overall I think I will be sticking with DuckDuckGo as my primary search engine a bit longer. I like how it looks, how it functions, and generally the searches it provides. I don’t think it will ever beat Google, it’s a very nice alternative.